For those of you who have always dreamed of being a team member involved in the rehabilitation of individuals with disabilities, you may want to consider learning about the duties and roles of a certified rehabilitation counselor. When you are contemplating the idea of returning to school, you need to consider all of the types of occupations that exist within the field of your interest. A certified rehabilitation counselor, also referred to in the field as a CRC, are professionals who are trained to help people with disabilities achieve their goals to live independently. Not everyone with disabilities has the same goals, and as a CRC, you will need to identify what occupational, social and emotional barriers your clients face, because of their disabilities. 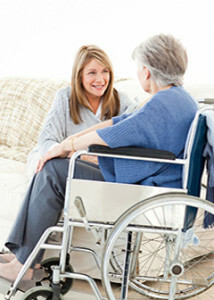 The very first thing that a rehabilitation counselor will do is to identify the needs and preferences of the client. You may conduct personal counseling sessions or group sessions with individuals who are suffering from similar ailments. During this time, you will assess the patient’s abilities, their interests and the unique personal obstacles in their way. As a CRC, you will become an expert in supportive therapy so that your client can move forward. Goals can be as small as learning how to walk a lap or as large as being able to live independently. Depending on the severity of the patient’s disabilities, there could be a long-term need for a team of medical professionals to work with a CRC to develop an individualized treatment plan. Typically, physicians, surgeons, nurses and psychologists will be members of the team to coordinate the best possible combination of care. As a rehabilitation counselor, it will be your role to help the patient learn new job skills or how to use assistive technologies. You may also work with the employer to develop a strategy so that the patient can return back to work as quickly as possible. In addition to supportive therapy and team coordination, you may connect clients with other resources so that they have the community help that they need to succeed. Because of this, you will need to build a strong relationship with both your disabled clients and also the leads within community organizations that help. As a CRC, it is common to work in vocational centers or within state or government agencies. If you are interested in studying to become a Certified Rehabilitation Counselor, you will need to study behavioral health or counseling and earn your Master’s degree. Once you have earned this degree from a school that is accredited by the Council on Rehabilitation Education, the next step will be to test for licensure in your state. Check with your state for licensing requirements, find out which accredited programs are convenient for you to attend and take the final step. With the answers to the question “What is a Rehabilitation Counselor?”, you can equip yourself with the knowledge that you need to find out if it is the right profession for you.